We have found there is an issue with some browsers holding previous purchase information. 1) Click the REFRESH button on your browser. 2) if this fails to solve the problem, on some browsers the "Void" box in the Check out window is not visible. This box will void the product from the check out. The box is located just to the right hand side of the item price in the check out box (please see attached photos) Sometimes if you hover your mouse over the area shown in the photo the box will appear, just left click the box to void the product. If the box does not appear when it is "moused over", just left click in the area shown and it will void the transaction. Click on the photos below to see enlarged photos. Here at AB Slotsport we are always keen to hear from our clients on stuff such as level of service and also in regard to Product Quality! If you have any comments on any product we have supplied you or our service, please feel free to contact us on the link below! Screen printed 10 thou lexan House car bodies! The paint just doesn’t fall off - because it’s not paint! The Ultimate 10 thou bodies for rental/house cars! 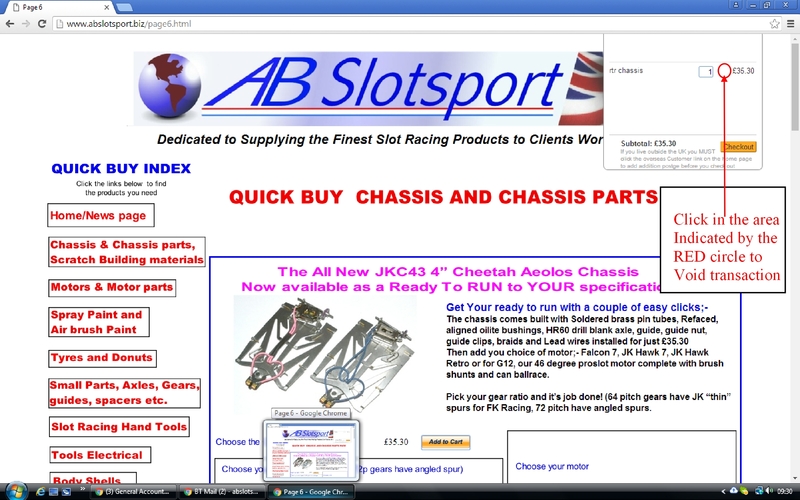 The only “FULL ON” slot racing Supplier in the UK with an SSL certificate to help protect our clients on the web! 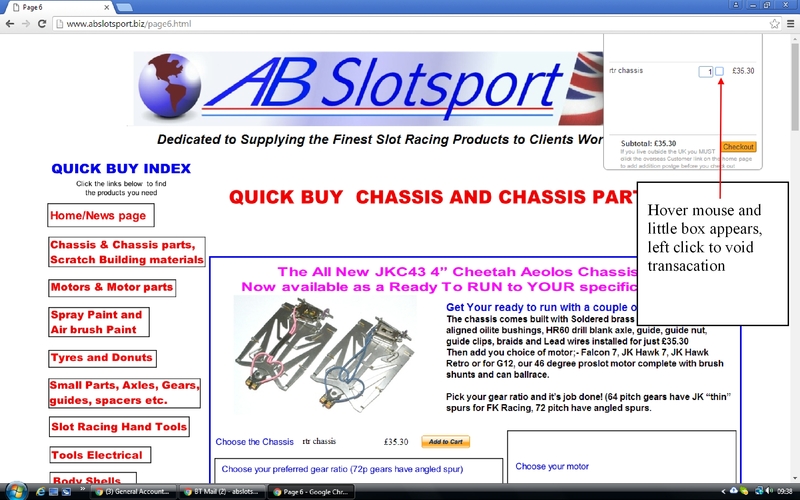 After testing by leading racers, AB Slotsport is pleased to announce the JK Eurosport Tri-Pin guide nut. It fits the original, great Tri-Pin wrench, but while maintaining the original features , including the underside annulus and reduced height, along with a 45 degree taper it allows eurosport and OG12 racers using chisel nose shells to utilise this great product. These nuts have the lowest profile of any guide nut on the market combined with totally positive location using the Tri pin wrench, No slipping over worn hexagons on wrenches and 100% of visibility of the entire nut when locating on the guide flag to ensure the nut tightens down square. Perfect, positive 3 pin location in the nut also ensures very precise and simple adjustment to ensure perfect set up and performance. THE ONLY GUIDE NUT YOU WILL EVER WANT TO USE FOR Eurosport and OG12 Classes! Click here for details! Please Note;- Due to major currency fluctuations it has been necessary to adjust prices on some newly imported items. We are sorry but this is totally out our control! If you wish to order more than 1 of a specific product, you can change the number of items at checkout and it will automatically recalculate your total. Welcome to the new Quick Buy Website! Just Click the links to the left to find the products you need. As you go from page to page it will keep track of your shopping basket. You can edit your shopping basket at any time during the process to either delete items (change quantity to 0), or change the quantity of specific items. Overseas Clients are reminded to CLICK the “Customers Outside the UK” link above to add additional postage for International air mail, tracking and insurance. The JK hawk 11 is in stock and ready to rock your world! Designed as a Drag Race motor, it is balanced, com tied and features high silver content motor brushes for ultimate hook up and torque, giving you great punch of the line and all the way down the strip.